Linutop, a French famous PC manufacturer has just announced a new ultra small form factor PC for embedded market. Known as Linutop 2, it has some enhancements over its predecessor, Linutop 1 that was launched last year. Some of the added features include an internal 1GB flash memory for operating system storage as well as higher 512MB RAM (up to 1GB) support, doubling what was previously installed in Linutop 1. 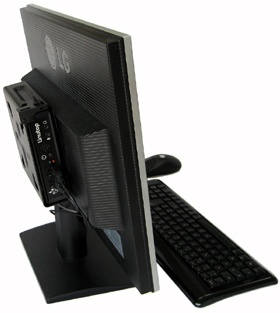 The Mini PC is powered by AMD Geode LX800 processor running at 500MHz. Although the clock speed may not be impressive, but its small form factor and low power consumption have made it an ideal candidate for various applications such as Flat Panel PC, Interactive Client, car infotainment that have space and thermal constraint. Even measured at 14 cm X 14 cm X 3.5 cm and weighted at merely 580 gram, it doesn’t compromise with capability to be connected to external peripherals. It is equipped with networking port such as 10/100 Ethernet, USB 2.0 host ports and optional wireless module for data communications. To make it perfect for graphic display, it is enhanced with 2D graphic acceleration engine that able to boost the display resolution up to 1920 X 1440. Furthermore, the mounting bracket accessory design enables it to be mounted directly to any compatible LCD panel. The device is designed to run on Linux OS. Priced at $410, it could be an ideal Mini PC to be installed either in your home or vehicle as a standalone entertainment unit.